This wasn’t the happiest season of Rick And Morty, was it. Oh sure, last season had plenty of horrible shocks (remember when everyone on Earth except for Summer, Jerry, and Beth, got Cronenberged? Also, there was the jelly bean king who molested children), but there was a playfulness to those shocks that kept them from being completely devastating. There was an excitement driving year one even in its grimmest sequences, a delight in the possibilities of the universe, even if that universe was rife with potential catastrophe and death. While season two hasn’t lost sight of that excitement, the thrill is somehow gone, at least for the characters. There’s a feeling that none of these people are exactly happy, and no crazy space-time adventure is going to fix their broken lives. Jerry is a putz, doomed to try too hard and fail regardless. Beth is still struggling with the trauma of having her father abandon her when she was young. Summer is—well, Summer’s mostly okay, but living with these parents, and this grandfather, doesn’t make for a stable adolescence. Speaking of Rick—maybe the most unexpected turn this season has been seeing the occasional glimpses of his, I guess we’ll call it “humanity” for want of a better word. Having Rick be a genius sociopathic hedonist worked just fine last year, and slowly realizing that he loved his grandkids and his daughter (and tolerated his son-in-law) no matter how many times he swore at them helped to give the character some necessary depth. But this season has, without ever belaboring the point, been in part about why Rick is the way he is—that his mania and callousness are a cover for deep-rooted depression and self-loathing. Okay, that sounds a bit heavy, and I should probably mention this now: “The Wedding Squanchers” was hilarious, in addition to being, by the end, pretty goddamn heavy indeed. I’m not suggesting the writers are offering us a schematic for Rick’s character motivation, but one of the things that makes the series so great is its ability to balance absurdity with effective, and sometimes deeply moving, tragedy. A goofy, dark show could’ve managed all of this, and been very good while doing it. But what elevates everything, and leads into a cliffhanger so strong that I’m actually a little angry at the people involved for forcing us to wait another year, year and a half (and rubbing it in!) 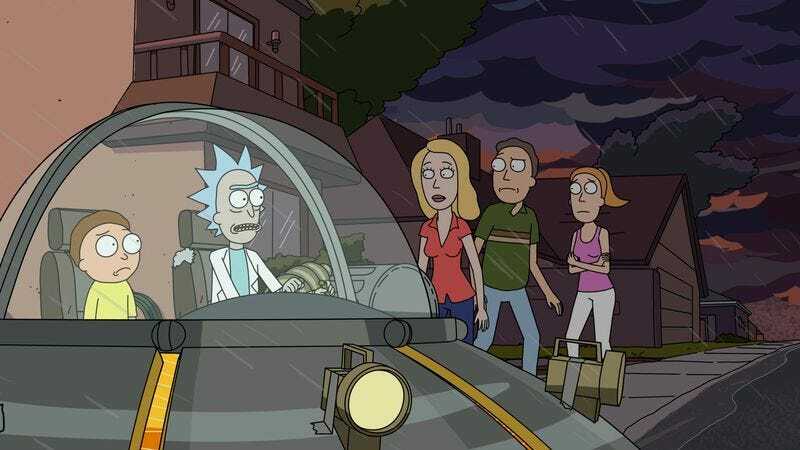 before we see things resolved, is watching Rick overhearing his family’s argument about him, an argument that inspires him to turn himself in so that Morty, Jerry, Summer, and Beth can all go home. It was a gut punch, and it only worked as well as it did because of the little moments we caught from Rick all season, seeing the him behind all the catchphrases and the crazed energy. There’s something dead and sad and fucked up in the guy. And it’s hard not to blame him much for it, considering that the purest, most noble act we’ve ever seen him take will break the hearts of the people he’s making it for. It’s a brilliant conclusion—one that both presents plenty of story possibilities for the season(s?) ahead, while still serving as a fitting conclusion to the show’s excellent sophomore year. 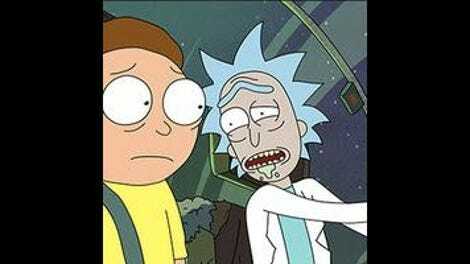 So, Rick and Birdperson fought together against the Galactic Federation, huh? Sounds a bit Firefly to me. Rick’s speech notes are the best.